Gathering relevant information about your holiday destination is the first step towards planning a good holiday. Take advice or recommendations from a friend or family member regarding an enjoyable place for a vacation. Make a list of all the locations you find interesting before zeroing in on one specific place. How to select a good holiday destination? You will find it useful to prioritize different locations on the prepared list on the basis of how Shariah-compliant these locations are. Don’t forget to take your family members’ opinions on board! How to gauge the ‘Shariah compliance’ of a location? Allah enjoins upon us to lead a balanced life. 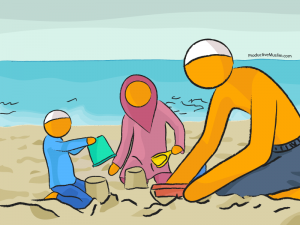 Since you are holidaying and are a responsible Muslim, you should be very mindful of the set of activities that one may encounter and how to deal with their permissibility or impermissibility in Islam. Many countries are investing in halal tourism. Malaysia, for example, has taken the lead in promoting halal goods and services, making the experience more enjoyable for Muslims at any time of the year. Once you have decided on your holiday destination that allows you to practice your deen as well as to spend quality time with your family, the next most important thing you must do is plan and budget! While budgeting the expenditure, remember that it is best to adopt the middle path – one of balance. It is imperative that we avoid overindulgence as well as miserliness. Leave behind enough funds for your dependents on whom you are obliged to spend. Bid farewell to friends, family and neighbors! Understand the traditions, customs and values of the local people of the country you are visiting and honor them. If they involve something that goes against Islamic teachings, do not indulge in them. “O mankind, indeed We have created you from male and female and made you peoples and tribes that you may know one another. Indeed, the most noble of you in the sight of Allah is the most righteous of you. Indeed, Allah is Knowing and Acquainted.” [Qur’an: Chapter 49, Verse 13]. Meeting new people from all walks of life is a unique gift of holidays and travelling. Bound in a single web of universal brotherhood, one can do da’wah by being an exemplary Muslim through one’s beliefs, morals and good manners. Zainab Khan is a student of Business Administration. She enjoys being with her family and finds biology and astronomy fascinating subjects. She believes that Islam is about good manners and that one finds peace in giving and forgiving.